They just don’t appear when I’m in the field. I want to come upon butterfly caterpillars, and I regret that I don’t have a treasure trove of images of this unique stage of butterfly metamorphosis. They remain in the shadows, or hidden from view, high up in trees, or unseen resting on the underside of ground hugging plants. Those who have amassed field guides to butterfly caterpillars have earned my respect. Hard to do, for sure. That explains my excitement when on September 27th I discovered a tree in Doak field, and on it were dozens of these chewing machines. 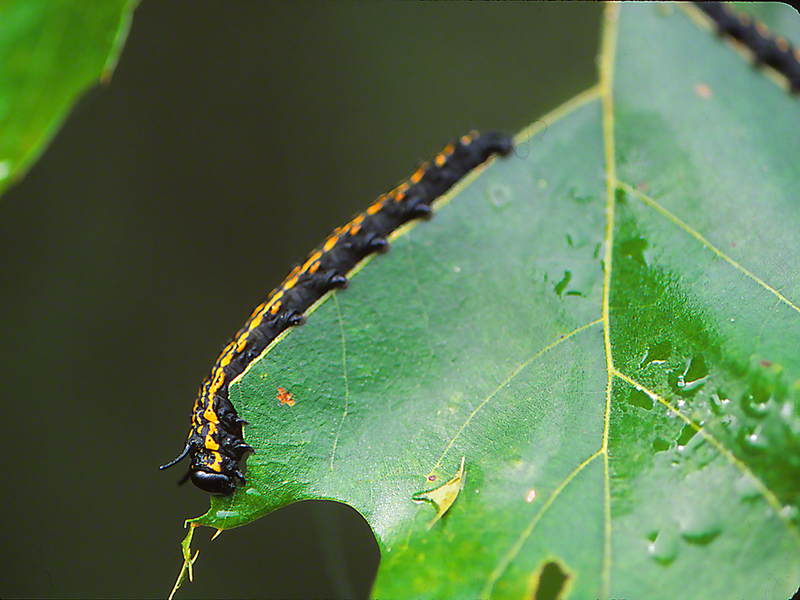 Striking coloration, a pair of horn-like extensions just back of the heads, butterfly caterpillars? How could they not be? Which? Checked my field guides for butterflies. No, no, no. These are moth caterpillars. Amazing critters they are, but . . . moth caterpillars. Back to square one, where, oh, where . . . why, oh why does my butterfly caterpillar cache not grow? ‘Tis not easy. Last year our many island deciduous trees had been invaded by similar colored caterpillars with a little more fuzz on their bodies. It was horrible and horrifying! The moths had laid the eggs high at the top of the tree making it difficult to destroy them before hatching. So, in the spring after hatching and they started to grow, the trees appeared to be covered by a very fine net. Then the caterpillars started to grow and grow crawling out of the net for more food, down the branches and trunks, muting on flowers, crawling thru the lawns, and spreading in all directions over the roads as these creatures moved about for food. Life will be pleasantly normal during the summers until seven years from now when they will return for another horrible invasion. as a kid i had a catepillar in a glasbox (in wintertime i found it hiding itself inside broccoli), later it turned out to be a butterfly!! i remember it became really tame, drinking sugarwater from my finger and lived for about three weeks. even though you’re not so keen in moths…ever since 1950 one thought in finland the digitivalva reticulella moth was extinguished…so this spring the lepidopterists were very thrilled to find a new population in lapland again. how was your recent journey? Winter snow and rain brought the promise of an Israeli Spring season of flowers and butterflies. Fields blanketed with yellows, reds, oranges, whites, purples . . . and butterflies! Many of them rare and seen only in March, exactly when I arrived. Family greeted me, and my camera soaked up all that it could find. Back home now, I reminisce, and am thankful for right place, right time. Thanks. Jeff, you (always) have such lovely narrative way of writing, makes me to see all that beauty…how wonderful to hear that you were able to achieve something so splendid. one day i hope to meet those rare butterflies on your site. ‘Oh, it is Paula, no worries. But when you see Jeff, hide…hide! If you don’t hide, he might get bored having seen and photographed us all. He will close down his blog and stop travelling. Guys, we can’t let that happening. So, interrupt your chewing for the sake of butterfly-kind and keep Jeff on his toes’. Is it not so that gifted people can bring a smile to even the most serious naturalist out in the field? Delightful, Paula.